Could these *be* more British? Dry, raucous humor is used to illustrate math principles. FUN MATH, you say? You bet! There's a whole series, the rest of which I have not read: math, science, history, you name it. They're hard to come by, since they are published primarily in the UK, but worth the hunt. Descubrí este libro cuando tenia 5 años y lo he amado desde entonces, de una forma inteligente y con un humor increíblemente sarcástico (para ser un libro "infantil") explican conceptos matemáticos y la resolución a problemas complejos. Cabe aclarar que el humor que manejan los libros de esta serie es muy británico y en ocasiones hacen chistes muy locales, fuera de eso creo que es una buena manera de introducir a los niños a las "mortíferas mates". Used as part of my teacher training. These books were a great way to engage children in what could be a 'boring' subject. They made it accessible and memorable making children more willing to learn. A wide variety of different topics are covered, to give students knowledge of the broad spectrum in mathematics. I'm really not a maths person so it took me a while to get into this book, but I ended up quite enjoying it and towards the end I actually tried out a lot of the calculations and tricks for myself. Very cool format to get kids into maths with a wide range of subjects covered. Recommended if you're looking for a quick, humorous introduction to basic maths. 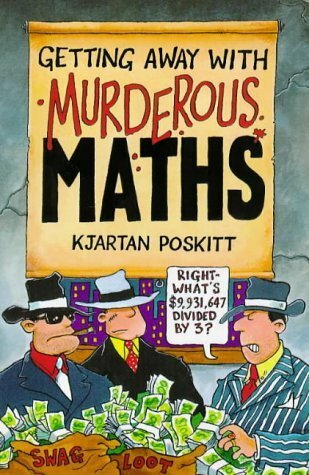 This book is great, It shows you the basic of "Murgerous Math" in a funny way with some cool cartoon pictures. this could be great for someone who want to re-visit the 1st-5th grade math experience. Great for late primary age maths students. Interesting, quite funny. The kids enjoy them. Good for a child who might find maths boring. Read aloud works well. A light read, funny, and for anybody who has ever encountered maths before. We love these books!!! We had to order them from Amazon UK, but it was worth it!! Entertaining and with lots of nifty tricks (even for adults). Kjartan Poskitt - Kjartan Poskitt is an author and TV presenter who is best known for writing the Murderous Maths children's series of books. Poskitt was educated at Collingwood College, Durham. In addition to his popular science and maths books, which include books on Isaac Newton (Dead Famous: Isaac Newton and his Apple), puzzles, practical jokes and secred codes, Poskitt has written a book of magical tricks, a GCSE Maths support book and four Rosie and Jim annuals. In 2007, Poskit published the first in a new series of children's novels called Urgum the Axeman.He also wrote the theme tune for the children's art program SMart, as well as the title theme and music for the first two series of Brum. He is also the creator of a logic puzzle, Kjarposko.He has been a presenter for a number of (mostly BBC) educational children's TV shows.